How Much Memory Should I Get With My New Mac? So you are thinking of buying a new Mac and you are wondering how much memory to get. It is a tough decision to make, and really comes down to a matter of money. 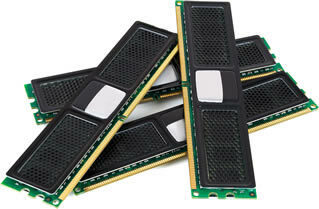 Lets look at factors that will help you decide if you should spend the extra money to get more RAM. There are not many people around who buy a computer with extra memory and later regret it. On the other hand, the world is full of people who buy a computer with too little memory and regret it later at some point. Memory comes in handy if you are manipulating large graphics and video files. What do I mean by large? An example would be an image that is 100MB in size. Now a typical photo you have on your Mac is probably 2-3MB. Who works with 100MB images? Designers who do things like create high resolution posters, magazine covers and other high resolution art. How about video? Does editing 15 minutes of vacation clips count as large? No. Editing together a season of 22-minute television shows, or a 90-minute movie, with 4K resolution is large. If you do image or video work like this, then you probably want to get as much memory as you can. If you just work with your own personal photos and videos, then it doesn’t really matter. How about games? If you are a serious gamer, playing in 3D worlds that require maximum frame rates on large screens, then you may also need a good deal of memory. But not necessarily. See the next section’s comments on the GPU. But if you are spending serious money on your new Mac because you want a great gaming machine, then you probably don’t want to skimp on memory. Another reason for getting more memory is to future-proof your Mac. A new MacBook Pro with 8GB of memory may be fine for now, but thinking ahead 4 years, perhaps the macOS out then, and some of the apps you may want to run then, will need more. So getting 16GB will make it more likely that your Mac will last longer. The way people think of computer memory today is a little old-fashioned. Not too long ago, more memory meant a faster computer. And that is still true. It is just not as true as it was a few years ago. Today, most Macs use solid-state hard drives which are much faster than standard hard drives. Computer speed today also relies more on the graphics processor (GPU) and the memory that is part of it. Software has also become more optimized to work faster and rely less on large amounts of RAM. A lot of what people think of as “speed” on a computer today is really graphics performance. Anything from 3D games, to video playback and editing, even to the animation of the operating system is handled my the GPU. A typical Mac user that chooses 16GB of RAM instead of 8GB may never notice the difference. If you are just surfing the web, writing emails, managing your photos, working with documents and watching video, then you may never use that extra 8GB of memory. As far as making your Mac last longer, keep in mind that no matter how much memory you stuff into your new Mac, at some point a version of macOS will come out that doesn’t work with it. Memory typically isn’t a factor in this, as it is the processor and logic board that will hold you Mac back in that case. And once you can’t upgrade your macOS, your machine is obsolete regardless of the memory. You may have heard that you can’t upgrade the memory of new Macs. This is only partially true. You can certainly open up and upgrade the memory in the latest 2017 iMacs. Apple even provides instructions here. You can also do it in a Mac mini or Mac Pro. But not the MacBooks, which have RAM fixed inside the machine. This means it is much more important to decide how much memory you want with a MacBook than the other models. Once you buy your MacBook, you are stuck with that amount of RAM for the life of the machine. On the one hand you’ve got to look at the reasons you want more memory. The main two reasons are if you are doing high-end professional work, or you want to possibly extend the life of your Mac in a future where that memory may be needed. Weight against that the bill. An extra 8GB of RAM in a MacBook Pro 13-inch will cost you about $200. Is it worth that to you? Perhaps save that $200 and put it toward your next MacBook purchase in three years? Ultimately the decision is yours. For most Mac users the extra memory isn’t necessary. But on the other hand, there are worse ways you can spend an extra $200, especially if you make a living using your Mac. I had to resurrect my old 2010 iMac. With 8 GB and OS Sierra, it was desperately slow. I upgraded the RAM to 16 GB (with Crucial), and it improved greatly. Thanks for the article, it helped greatly when thinking about what to do with my new iMac.